More dark clouds are massing on the horizon for Singapore exporters, according to the latest gloomy trade statistics. 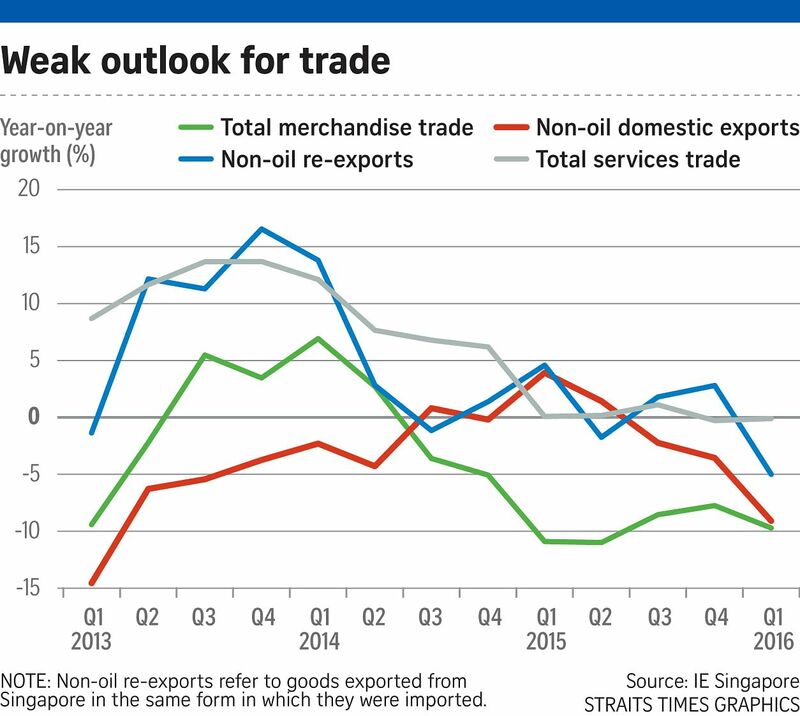 Trade agency IE Singapore has made a sharp downward revision to its trade forecasts and now expects non-oil domestic exports (Nodx) to decline between 3 per cent and 5 per cent this year, from an earlier forecast of 0 to 2 per cent growth. This came after Singapore's export slump worsened in the first three months of the year - Nodx shrank 9 per cent in the first quarter, compared with the same period a year earlier. Shipments to eight out of 10 of Singapore's top export markets slid in the first quarter, IE data showed. The biggest contributors to the contraction were China, Taiwan and the European Union. Both electronic and non-electronic Nodx were hit. There has been no reprieve for exporters since the first quarter. Data released last week showed Nodx fell 7.9 per cent in April from the same month a year ago. The global economic outlook has weakened since the start of the year, IE Singapore said in a statement yesterday explaining the downward revision in its forecasts. The nascent recovery in the United States has slowed in recent months and China's economy is expected to ease further this year. In addition, persistently low oil prices are expected to continue weighing on Singapore's oil trade, IE noted. CIMB economist Song Seng Wun said global trade volumes have been below trend for the past five years on the back of lacklustre consumer and business sentiment. "There has been no catalyst to induce consumers around the world to open up their wallets in a meaningful way," he added. The tepid global environment has hit manufacturers here especially hard, as two-thirds of manufactured goods are exported. Manufacturing and export statistics show a similarly gloomy picture of broad-based weakness, said OCBC economist Selena Ling. While biomedical manufacturing output has held up relatively well, compared with the rest of the sector, there are likely to be limited spillover effects from this to the rest of the economy, she noted. Said Ms Ling: "(Exports) are likely to meander along the bottom over the rest of the year." PTS Technologies chief executive officer Albert Loh said some of the company's customers in the United States and New Zealand have "reduced their orders quite significantly". The firm makes radio frequency identification tags. However, Mr Loh said the company has managed to secure fresh orders for its new products. As a result, sales have gone up 15 per cent this year, compared with last year. "On the whole, the export market has been weaker... But by enlarging our base, we have cushioned the impact," he added.